KC Masterpiece® Honey Teriyaki Marinade. Place the Tyson® chicken wing sections into a GLAD® food storage bag. Pour the apricot teriyaki marinade over the wings so they are completely covered. Marinate in the refrigerator for at least an hour and a half. Build a charcoal fire with Kingsford® charcoal for indirect cooking by situating the coals on only one side of the grill, leaving the other side void. While the grill heats, remove the chicken from the marinade and lightly sprinkle with KC Masterpiece® Barbecue Seasoning. Once the grill has reached 450°F, put the chicken on the void side of the grill. Place the lid on the grill and cook the chicken indirectly for 10 to 15 minutes until the chicken reaches an internal temperature of 180°F. Remove from grill and serve with King's Hawaiian® Sweet Dinner Rolls. 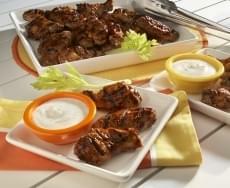 Credit: Recipe created by the KC Masterpiece® outdoor kitchen, exclusively for the BBQ Pit Wagon.